(Hapilos Entertainment) - Hapilos Entertainment Group announces a new addition to their roster by welcoming dancehall artist "ANARCHIE". Although you might not yet be familiar with this talented young man, Anarchie has been crafting his musical education since attending Jamaica College High School For Boys, but it is under the mentoring of Bounty Killer that he developed his skills as an artiste. 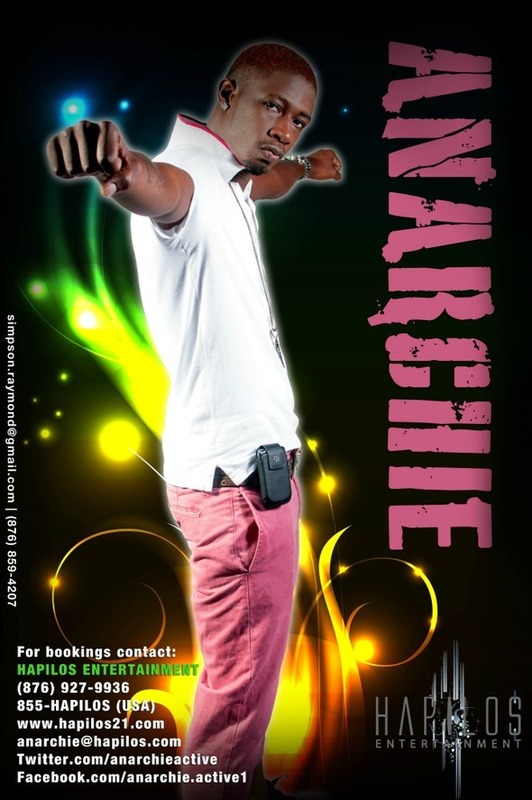 Anarchie credits veteran DJ and founding member Bounty Killer as being a major source of inspiration, he dubs Bounty as being his musical“fadda”. From the gained knowledge, Anarchiefounded his own studio called “Active One Productions” and wrote a song for Bounty Killer called “War Bridge”. As any rising artist knows, performing is also a major part to a well rounded artist, and performing alongside some of the biggest names in the dancehall fraternity Anarchieperfected his stage presence. Anarchie performed for his fans on some of the biggest stage shows such as Saddle to the East in 2006, Fully Loaded in 2008 and The Arthur Guinness Show in 2010. His debut single “Ghetto Nice But It No Pretty” on the MockingBird Rhythm was well received and led to several more singles such as “Brutal Conflict”, “The Message” and the hit “Just Gi Mi Weed” to which a video was released. His charisma, talent and exposure led him to be introduced to Hapilos Entertainment, and the connection was instant and mutual. Anarchie found his home and is now the newest artist signed to Hapilos Entertainment. “Out of all the things that Hapilos Entertainment does as a company, be it distributing, producing and marketing music, staging and promoting events, managing and booking artistes, artiste development is our favorite. To take a young talent like Anarchie, build on what he has and develop him into a successful musician brings us great satisfaction. We appreciate the challenges that come with it; The roadblocks, the hard work and obstacles that a young artiste trying to make it in this business encounters today. We welcome all these challenges because it makes the success that much satisfying and we are confident that with the skills and talent that Anarchie has, Hapilos Entertainment can make him into a great artiste." states Hapilos management.